My little tiny brain is just buzzing, percolating, zinging, firing on all cylinders, moving at warp speed. I am so fired up with ideas! I just spent 2 days in a room with 6 other glass bead artists taking a 2 day workshop with Leah Fairbanks, queen of the floral gardens. She is an amazing teacher! So yeah, I guess I need to get out more. I love my studio to bits however sitting in a room all by myself can be a bit limiting. Thankfully I do live in a large city however even here there’s not a whole lot of glass bead artists around. And online time just isn’t the same as sitting in a room with other people who’s eyes light up when talking about which clear is better. Oooooohhhh, it was SO good! Talk about jam packed with information! Leah’s style is totally different from my normal glasswork and different is good. Trying new techniques and directions is always good. There’s so much I see online and think hmmm, how the heck do they do that? Now I know. She answered so many questions. I’m not sure what I’m going to do with all this information. 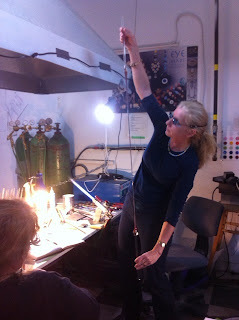 Right now I need to read over my notes and spend some serious torch time experimenting. If only I didn’t need to sleep! All I want to do is make beads! I’ve finally figured out why I burn my rubino all the time. And why my stringer work was so droopy. 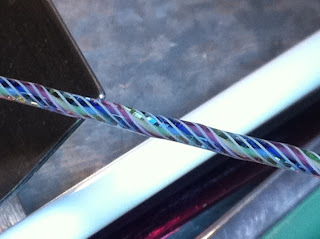 And I made a rainbow cane! And a hollow bead, my first hollow bead ever! OOOOHHHH! did I mention is was SO MUCH FUN?